One of the hottest spots in Blue Ridge Mountains to buy a home is the culturally diverse town of Asheville North Carolina according to Real Estate Scorecard. A place where rustic mountain cabins are trumped by modern contemporary homes with walls of glass windows showcasing the grandeur of the region. In a normal real estate market, homes typically appreciate. The percentage of increase can be based on a multitude of factors. Whether it is location, architectural style, the age of the home, amenities, size of the house and number of bathrooms are all reasons why home shoppers select one home over the other. That trend changes annually and the results of those trends are tracked by the reputable Board of Realtors®. In a recent analysis of annual appreciation growth in millions of home sales nationwide, statistics highlight eight factors where home values have consistently risen. Modern/Contemporary home styles led appreciation values in architectural designs with an increase in value of 7.7%. Bungalows noted a 6.5% increase, traditional rose 5.6%, ranch homes 4.5%, Craftsman 3.7% and Victorian 2.2%. Over the last 5 years, the size of property matters. Research found that homes under 1200 square feet was the preference for first time buyers and retiring Baby Boomer with a notable appreciation of 7.5% per year, while homes 2400 square feet and above rose only 3.8% per year in comparison. Open Floor Plans are desirable for living spaces with an average annual appreciation of 7.4%. Not so “hot” items such as granite countertops appreciated only 2.5% and stainless-steel appliances just 3% annually. “Less is More” when it comes to Bedrooms. Since 2012, homes with one bedroom rose an impressive 7.2% in value, 2 bedrooms experienced a 6.6% gain, 3 bedrooms a 6.3% increase and the lowest appreciation value of 4.9% for 4-bedroom homes. “Homes with a View” ranked higher on the list than those without. Park views increased property values by 7.9%, mountain views came in at 5.1% and lake views noted a 4.9% incline in value. Location matters…Urban homes located near mass transportation rose 8.4% in value annually. Access to quality schools increased home values by 7.2% and nearby shopping added 6.5%. Amenities also matter in home resales. Patios increased property values by 6.8%, followed by homes with hardwood floors which rose 5.7% and fireplaces added 5.3%. In Asheville neighborhoods, mountain modern architecture has become a highly desired home style and is quickly changing the image of a traditional “rustic mountain cabin” according to Kelly Erin-Spinney and Troy Winterrowd of Modern Asheville Real Estate. One of the main reasons the “green architectural philosophy” is so popular today is the prevention of environmental degradation which is basically the depletion of natural resources like air, water and soil. Preservation of natural surroundings is quickly becoming a top priority for housing developments and shoppers are taking note especially when designing new homes in Asheville North Carolina. It makes sense because Asheville has some of the most beautiful landscaping in the country as it is strategically located between the impressive Blue Ridge Parkway and the Great Smoky Mountains. Referred to as the “Land of the Sky” by locals, the majestic mountainous terrain and progressive artistic expression found in Asheville inspires “going green” to insure the region is preserved when building properties here. Modern homes reflect the desire to invite a relationship with nature and “green designs” are the trend when it comes to building “environmentally friendly” living spaces. The new generation of architects create designs which will incorporate the psychological benefits of living one with the great outdoors which helps nurture the soul, elevate mood and boost overall well-being. Contemporary structures have massive windows that allow natural sunlight to flow throughout the living space while inviting the outdoors inside to energize the soul with spectacular mountain views. 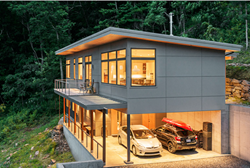 Many of the Asheville new homes are developed to embrace the connection to natural surroundings with bright and open designs incorporating walls of glass to enjoy the scenery found in Asheville neighborhoods scattered throughout the Great Smoky Mountain region. New technology allows comfortable homes with high energy rewards, efficient use of space and a lot less clutter. Contemporary homes also feature outdoor fire pits of all shapes and sizes that can be made of sculptural steel elements that heat up and radiate warmth while enhancing the overall structural design of the exterior of the home when not in use. Modern housing also is the use of creative lighting throughout the open living spaces. Building materials are also evolving when building contemporary homes. Mixed textures and recycled materials are now the norm when selecting sustainable mountain housing. Products like recycled glass or quartz are often used to add distinctive flair to interior finishes creating a unique and innovative sparkle to the finished product. Simplicity with extravagance reflects the personality of the owner who can admire the home as a piece of functional art. Take the time to explore the mountain modern architecture and experience first hand the lifestyle offered in these recreated “rustic mountain cabins”. It is also wise to seek the expert guidance from those who live in and know the best Asheville neighborhoods to live. Real Estate Scorecard encourages folks who are planning a trip to Asheville, to meet with Kelly & Troy at Modern Asheville to explore some of the most beautiful modern homes in the region. Call Modern Asheville directly at 828.552.4811.